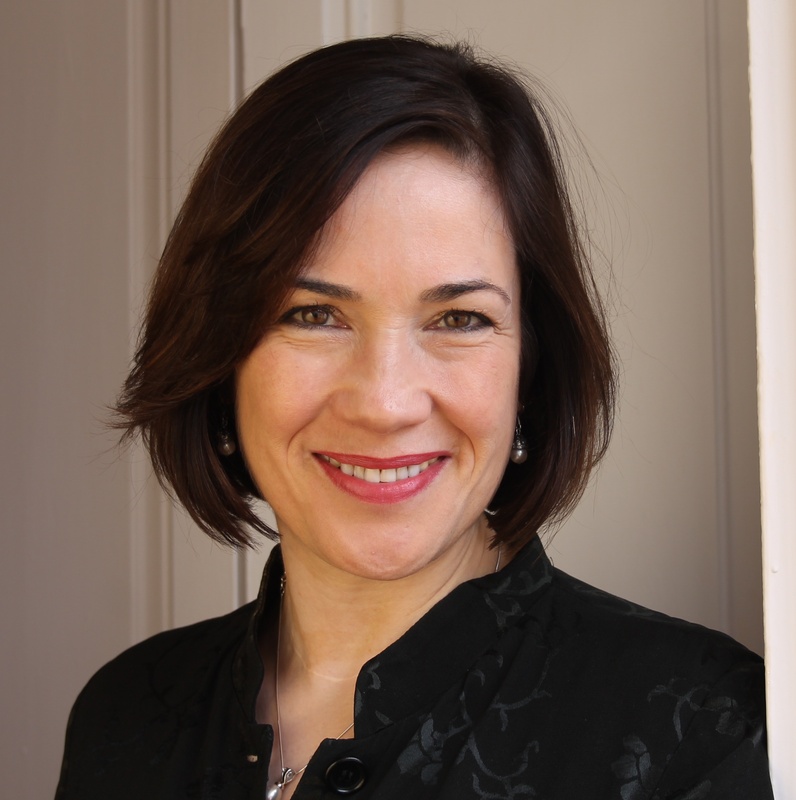 Interview with a Helen Darbishire, founder and director of Access Info Europe, one of the civil society organizations that has been working longer and harder for transparency in the Adminstration and Public Institutions. I met Helen a couple of years ago. She always was at the front of Access Info Europe, a civil society organization where she spent years working and fighting to achieve a more transparent and fair society. In her NGO they worked in transparency for Governments and Public institutions in Spain, en Europe, transparency in the Mercantile Registry, in public decision making, media ownership, lobby regulation, etc. First of all, a little bit about you. Who are you and what do you do? Hi, I’m Helen. I am many things, but in my professional life I describe myself as a human rights activist. In 2006 I founded the human rights organisation Access Info Europe. 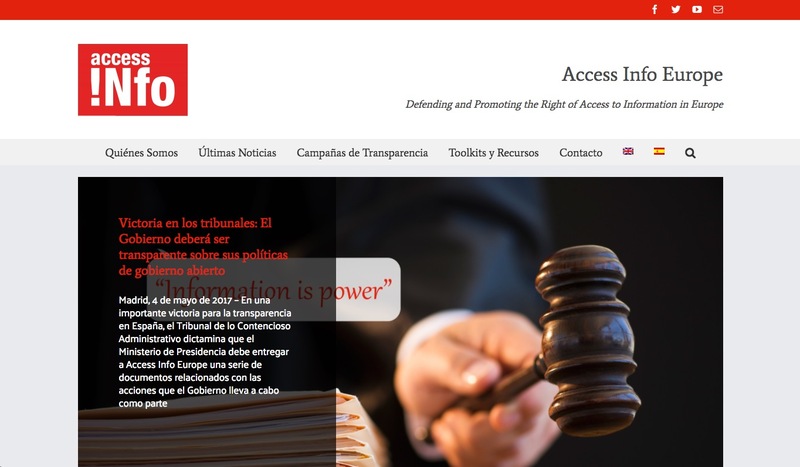 We are based in Spain and we work across Europe promoting the right of access to information. We have pushed for access to information laws in Spain and other countries, and we are always working to improve the quality of the laws. We also work on transparency in practice, helping other civil society organisations, journalists, and citizens obtain information from their national or local governments and from the European Union. I work full time on this, with Access Info getting funding from private foundations and from bodies such as the EU, Unesco, etc., as well as donations from the public which are much appreciated and really helpful for our work. Before 2006, I had already been working in this field for a while. I’ve had the huge privilege to be able to work to defend and advance human rights in some of the world’s leading organisations, including Article 19, a London-based, freedom of expression organisation; I ran their Europe programme while living in Paris, although I also spent a lot of time in the Balkans and even had a flat in Tirana, Albania at one point. Then I worked for the Open Society Foundations (based in Budapest and then New York) running their programmes on freedom of expression and freedom of information. Building on all that experience, in 2006 I came to Madrid and set up Access Info Europe. The organisation has had a positive impact. At a personal level, I really enjoy my work and I absolutely love living in Madrid! What is an activist? Do you consider yourself to be one? An activist is anyone who takes the initiative to participate in public life, in public debate, in order to improve society, advance human rights, and improve democracy. I am an activist and I believe in bringing about change through debate, through use of our democratic and legal system. So for example, Access Info takes does a lot of litigation (in Spain, at the EU level, and with partners in other countries). In Europe we are fortunate to have a democratic system that allows such engagement and achieving change through peaceful actions. And my personal experience has shown that a few people getting active and – this is essential – getting organised, can make a huge difference. Es una ley que da a nosotros, los ciudadan@s, el derecho de solicitar información del gobierno para saber que están haciendo y como están gastando nuestro dinero. Al final del día, tienen que rendir cuentas a nosotros, ¿no? Pagamos sus salarios. El Tribunal Europea de Derechos Humanos, el Corte Inter-American de Derechos Humanos, el Comité de Derechos Humanos, todos han fallado que el derecho de acceso a la información es un derecho fundamental. Hay límites, pero solo para proteger información que de verdad es sensible. La gran mayoría de la información en manos de entidades públicas es nuestra información (hemos pagado por su creación) y debe ser accesible a la ciudadanía. Do we have a good FOIA? Could you tel us the best and the worst of the Spanish Transparency Law? The Ley de Transparencia is a mediocre law compared with the total of 115 laws worldwide it comes in position number 80 and scores just 73/150 points. One huge weaknesses is that you have to identify yourself to ask for information. Making requests via the Portal de Transparencia is only possible if you have a digital signature, which most people still don’t. That’s why we have relatively few requests for information in Spain. This is very different from many other countries, where asking for information is simple: just a simple email with a request is sufficient as it doesn’t really matter who is asking. Another huge problem with the law as it currently stands is that it has a limitation on what can be requested in a very problematic Article 18, which excludes “informacion auxiliary” from the scope of the law. Such auxiliary information includes drafts, notes, reports that are deemed to be “internal” and communications between public officials. We have had some success in the Courts in weakening this limitation, but it’s still a challenge and it totally out of line with international standards and with others laws. Then there are the mechanisms for overseeing the law, the Consejo de Transparencia, is not strong enough. A truly independent (Parliament appointed), strongly financed, and properly empowered oversight body is needed. It should have a mandate to train public officials. And, as is the case in many other countries, it should have the power to sanction bodies that do not comply with the law – that is something that the Data Protection Agency can do and there is no reason why the Consejo de Transparencia should not have those powers. And last but not least, the legal landscape for access to information in Spain is very complicated, with lots of laws at different levels, state, CCAA, and municipal. This makes it very hard for the requester to know where to turn to ask for information. The problem here is the failure inside Spain to recognise the right of access to information as a fundamental right, even though this is clearly done at the international level. That’s the difference with privacy / data protection: we have just one data protection law but a huge number of transparency laws. I hope that that situation will change in the future when we manage to establish here in Spain that access to information is a right of all people. Does transparency helps Democracy? Is it the solution to all evils? Would more transparency end with all corruption? An access to information law is an essential democratic instrument. But we have to be clear: it’s necessary but not sufficient. Many other mechanisms are needed. When it comes to fighting corruption, one needs laws that clearly define and outlaw corrupt behaviour. Then you need prosecutors and courts who will enforce those laws, so that once information about illegal activity comes to light (either via access to information requests or via leaks and whistleblowers) then those who have violated the law are prosecuted. Preventing corruption requires a whole series of mechanisms, things such as assets declarations, conflict of interest rules, rules against revolving doors, and so on. You need oversight bodies to be established, such as a well-functioning Tribunal de Cuentas, and other inspection services. There also need to be rules about how to conduct public procurement, how to take decisions – after all, “corruption” is not only about money being stolen, it’s also about traffic of influence that results in benefits for friends or relatives. Similarly for advancing democracy, increasing participation, improving responsiveness by politicians to the demands of citizens, a further series of mechanisms are needed. You also need rules about things that have to be done before decisions are taken, such as doing an environmental or a human rights impact assessment, or running a public consultation. For there to be a free and fair public debate, you need to ensure that NGOs are allowed to operate freely. And of course it’s absolutely essential that there be free media. That in turn requires rules such as how to appoint heads of publicly funded media, and rules requiring transparency of media ownership so that we know who is behind the stories we are reading. These are just a few examples of the complex legal and practical framework that should be constructed to achieve a functioning democracy. An Access to Information law is clearly only one part of that framework. But it is an especially important part because without it you can’t get information to know whether the other parts of the system are functioning well or not. What do you think about whistleblowing? What do you thing of organizations like Wikileaks or Fíltrala in Spain? Leaks are an indicator of something wrong in the transparency system. Ideally we should have all the information we need to hold governments to account. Evidently we have not yet achieved that, in many countries. So we rely on whistleblowers to leak information, and that is why it’s really important to protect whistleblowers. Sometimes the leaks are about illegal activities and sometimes about things that are strictly legal but at the same time are ethically problematic. So, with the Panama Papers and Lux Leaks, we learned about offshore companies, money laundering, tax avoidance and other problems, some of them clearly illegal, others barely inside the law but clearly unacceptable to voters, such as learning that high level politician are avoiding paying taxes when the country is in crisis. In terms of how information is leaked, there are different models that have been used during the past few years. Certainly platforms like Wikileaks and the many, many that have followed, including Fíltrala, have provided a useful channel for some whistleblowers, as well as – one hopes — security about their identities. At the same time, I do think that it’s essential to have investigative journalists thoroughly reviewing any leaked information, cross checking with other sources of information, verifying facts. It’s also really important to ensure that any potentially sensitive data (such as the names of individuals who might be at risk) is not make public. Furthermore, in order to have an impact with the story, having journalist roll out the news, sometimes in a coordinated fashion across many countries, helps to ensure that the scandal results in an impact on the corrupt or illegal behaviour that is being exposed. What kind of projects does Access Info Europe develop? In 11 years of operation we have done a huge amount of things. We have successfully promoted laws, including the Spanish law, as well as successfully fighting against negative reforms, at the EU level and in a number of countries. We have requested a lot of information and taken many many legal cases to fight to get that information. We don’t always win, but usually we are successful. We have even won a case against the European Union at the European Court of Justice. In Spain we just one a case to get information from the Ministerio de la Presidencia about – rather ironically – it’s open government policies. 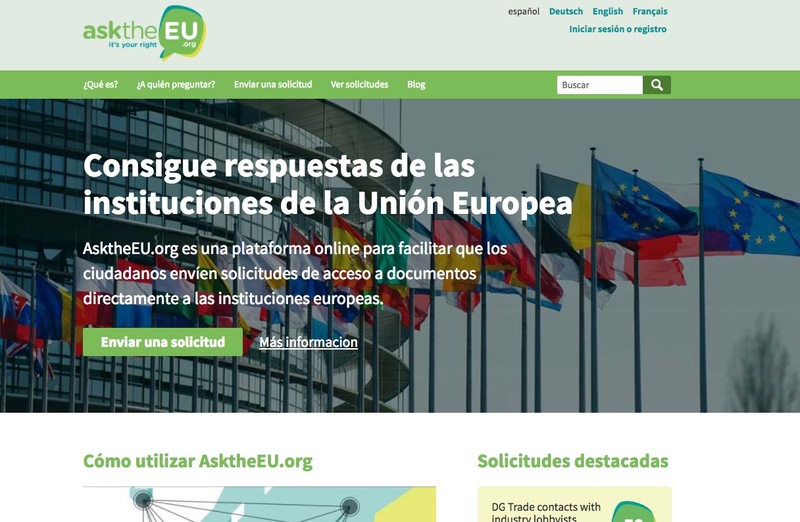 We make it easier to request information, with our EU request platform AsktheEU.org, which we run with the organisation mySociety in the UK. We run an evaluation of all the access to information laws in the world, the RTI Rating. We are actively engaged in the Open Government Partnership and have develop a set of Open Government Standards. With other organisations we have developed standards on lobbying, the International Lobby Regulation Standards. 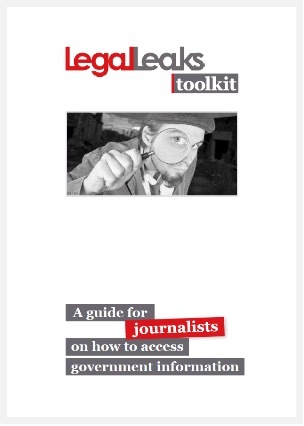 We have produced a series of guides for journalists on how to use the right of access to information, the Legal Leaks Toolkit. We have also conducted a lot of research and monitoring of transparency in practice, including recently the first every pan-European survey of decision making transparency which found very low levels of transparency in many countries, and very poor record keeping of things like minutes of meetings, so these are things we still have to work on. But it’s not all negative. We get a lot of information as well. We have helped many organisations and journalists get information about many things, including: information on migration and the refugee crisis, information on lobbying in Brussels, information on policing of protests, information on the fight against corruption, information on renewable energy policies, information on government contracts, information on spending of public funds, information on housing policy, information on chemicals going into the environment, and so on. And if anyone reading this has an idea about information that you want to ask for, information that would help you be an activist, then please don’t hesitate to contact us. What can someone do to participate in public life, but without having to go through Political Parties or Governments? do you find it to be effective? Can you do politics without Political Parties? Se puede y, en mi juicio, se debe hacer política sin partidos políticos. (in Spanish in original) It’s absolutely essential that there be civil society actors who are independent of party politics and who are ready to monitor compliance with principles and not engage in political compromises. In that sense, in every society we need those who are pragmatic and realistic but also those who are idealistic, who keep pushing for things to get better. I always say that “human rights have no political colour” and a fundamental approach of my professional life is to be ready to engage with all political parties to discuss issues of transparency – and to be ready to criticise all political parties who violate democratic values and human rights norms. I think it’s very important for civil society organisations to remain neutral when it comes to party politics. For individuals, citizen participation in democratic debate is absolutely essential and there are multiple ways to do it. Indeed, the ways are not mutually exclusive: you could be involved with a civil society organisation through signing online petitions or writing letters, you could be actively volunteering in a local community organisation helping people in your neighbourhood, as well as taking in part in demonstrations about an environmental or educational issues, as well as possibly being active with a political party at election time. A great guide on the way to start doing this is to read a fantastic new book called “Lobbying for Change” by Alberto Alemanno of an organisation called The Good Lobby. Alberto is also president of the board of Access Info Europe, and his book shows how it’s possible to, as he says, “find your voice to create better society” – the books if full of ideas of how to get engaged. If you have an activist part of yourself, can you describe it to us? How do you do politics? For me being an activist means acting on my beliefs. I believe strongly in the possibility of a democratic society in which a range of institutions function well to ensure that the government serves the people, taking decisions that are in the best interests of the public good, and always respecting human rights. And so, I have taken a decision in my life to act on that belief and to make my professional career out of contributing to that vision of a democratic society. At a professional level, I don’t have a political opinion. So we are talking here not about party politics but about pressing for a good democratic system. Basically what I do, is that I ask a lot of questions. Maybe that’s because I have a scientific background (I studied history and philosophy of science at university) and I am always asking “is that really true?”, “is it really like that?”, “does it really have to be like that?” and I am always trying to find out more facts about how things work, so that we can find ways to make things better. That applies to government decision: did the decision really have to be like that? Did the decision makers consider another way of doing things that might be better for all people? Did the lobbyists pressure to have the decision done in that way? What are the alternatives? Were the people affected by the decision consulted first? Has there been a proper debate? Getting the information that helps answers those questions is what we do at Access Info. We use the legal system to obtain information. I am not a lawyer by training, but I have learned a lot about laws. I believe that citizens have to know what the laws are in order to defend our rights! Not everyone has to be a full time activist, but in my case that is what I am. I am very fortunate to have been able to do that, and not only is it fulfilling, but it is fascinating work. I also get to meet fascinating people. Sometime they are very famous and inspiring people (simply to have shaken the hand and had a conversation with people like Nelson Mandela or the Dalai Lama is a huge privilege in this life) but many of them are ordinary people, who are working to solve everyday problems in their community, and those people give me a lot of inspiration as well. To be part of human society and to collaborate with people who are working to make things better for everyone, is a very important thing in life, and it is incredibly satisfying to be able to do it. Y yendo a los personal, ¿qué consejo le daría a una persona que quiere cambiar la sociedad pero que nunca ha hecho nada activamente: se siente sólo, piensa que no puede, no se ve capaz, no sabría por dónde empezar, nunca se ha asociado, no ha protestado, etc…? ¿Qué le diría?The first thing if you feel that there is something wrong, that there is something you want to change is to take a deep breath. To bring about change you need a clear head and a good strategy, and since we don’t think clearly when we are feeling angry or frustrated, it’s best to park those feelings. If you want to bring about change, it’s time to stop complaining and start thinking! I would say that the basic steps are to gather information and allies. Start researching, find out about the issues, find out who is working on it, go and talk to them. You might find for example, that other people have already complained and formed an association that you can join, or they may have already done a petition on a platform like Avaaz or Change.org. You might find that an official, such as an Ombudsman or a local councillor or a member of parliament, has already taken up the issue. And when you go into talk to these people, be professional about it, make sure you have your facts ready, but also be ready to ask questions and to listen: they may have information or insights that really help you with your campaign. If it’s a legal issue talk to the lawyers and make sure that you understand what the law actually says and what the possibilities for change are. When you gather all this information and talk to people, you might realise that the problem is slightly different from how you originally thought. That’s ok, you have to be open to revising your strategy as you go along. Next you need to accept that change takes time. That doesn’t mean that you can’t achieve things quickly, especially if you have a really compelling case or mobilise a lot of people. Think of those people who were in the Puerta del Sol in May 2011 and are now in government. Four, five, six, years may have seemed like a lot back in 2011, but actually it’s a tiny fraction of time and now some of those people are in a position to really make changes in practice. We see that in Madrid City Hall with the people working on transparency and participation for example. At Access Info we won a case against the Council of the European Union to get access to a document. From the moment we asked for the document in November 2009 to when we won the case and received the copy, in December 2015, a full six years passed. Was it worth it to fight for six years for just one document? Yes, it was because that court ruling set jurisprudence that has helped other people to get information. So: be focused, think clearly, gather facts, find allies, and be ready to be determined, patient, and persistent. And last but not least: remember that you are a citizen, that you have rights, and that the rights to expression and association are protected by the Constitution. No matter how people treat you, maintain your dignity and keep pushing your message, knowing that you have a right to defend your rights! Thanks for all the questions! I would just underline that anyone – and I really mean anyone – can have a positive impact on our societies. If you are thinking about something you’d like to do, if you have an idea, if you want to request information to get started, really don’t hesitate to contact me and my colleagues on the Access Info team. We are very busy, that’s for sure, but we always try to find time to talk to people who are interested in our work or who need help or guidance. And if you like what we do and want to help, there are various ways. Donations of money or time are always welcome. If you want to be a volunteer, send us a motivation letter. We also have a quite competitive, high level, intern programme. Our office is in the centre of Madrid, and we welcome visitors!